Have you been away on your summer holidays yet? Did any of you manage to get to the Big Apple? Or are you looking to make a cushion, a fun one? Or a perhaps you’re looking for perfect gift for the World’s Best Teacher? 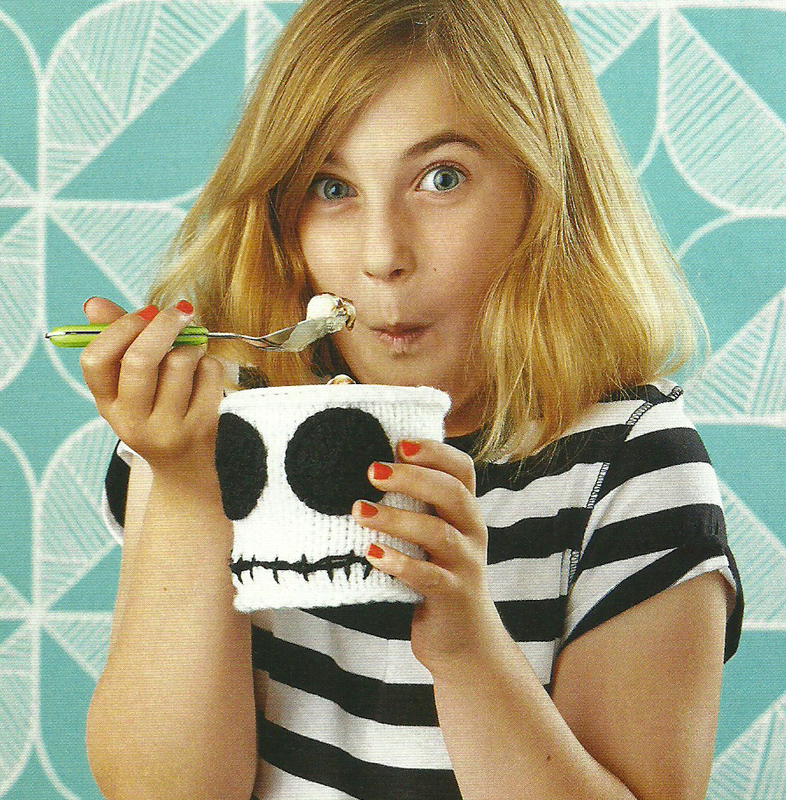 Halloween Knits, Monsters, Eyeball Cushions, Bats…. I love designing for Halloween, I love the colours, I love the fun, I love getting to be as silly as my imagination will allow. This is the third year running I have been asked by Simply Knitting Magazine to design a collection of projects for the Scary Season. I have had the same model for each shoot and it has been lovely seeing her grow into a young lady. This year I have four Halloween projects featured in issue 125 of Simply Knitting Magazine. This comedy cushion will get a giggle or two as you hide from the Fright Night Movie. Knit in the round from the centre out in chunky yarn, this project works up super fast. With their furry yarn and big green eyes, Simply Knitting said these were possibly the best slippers they had ever seen! I was thrilled to read that *blushes*. These cute critters are worked by holding a strand of aran yarn together with the furry yarn to give the slippers a nice sturdy feel and ensure you get plenty of monster miles out of them! Go Batty for these charming knitted bats, with their Velcro fastenings these would look great just about anywhere! I am looking forward to getting them back and putting them on Little Misses bike! I hope you have enjoyed these as much as I did designing and making them. As always I would love to see your finished projects on my Facebook page and on Ravelry. 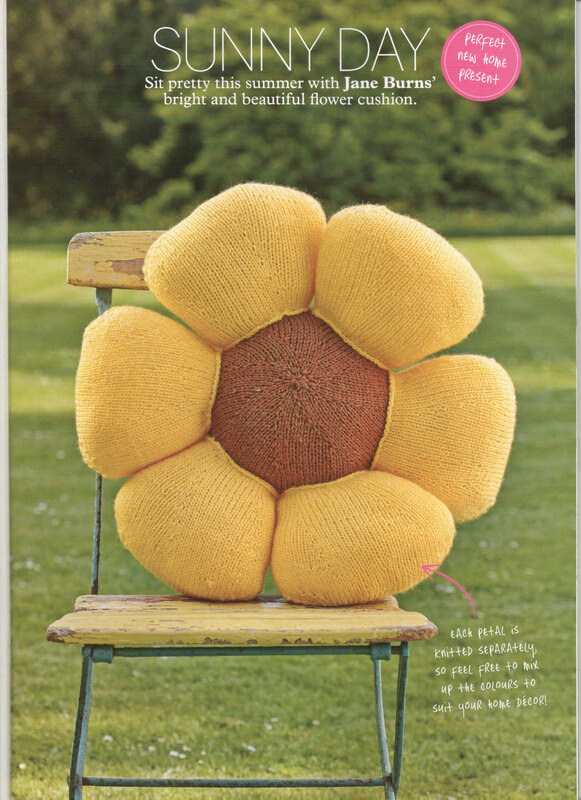 Hello there my yarn loving friends, guess who got their design on this months issue of Simply Knitting? That would be me and I am still grinning about it. Measuring a whopping 50cm in diameter this cushion will bring a smile to more than one set of cheeks! Make a statement with this bold cushion and bring some sunshine into your life no matter what the weather. It is perfect indoors or out. Sunflowers not for you, simply change the colour or go wild and knit each petal in a different colour for a truly bold statement! I would as always love to see your finished projects on my Facebook page. 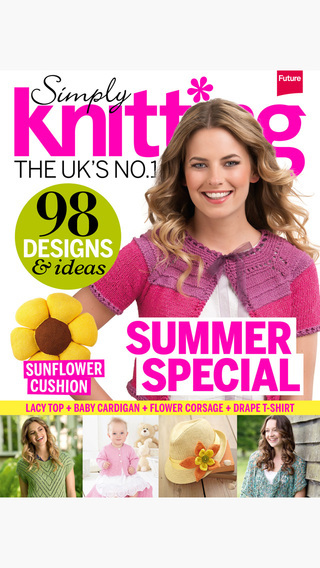 You can download your copy of Issue 123 of Simply Knitting magazine here. Happy Knitting! Another summer weekend, another summer festival, and as Jane and I enjoy watching ‘The Pixies’ live at T in the Park, we both have a sense of achievement. Starburst Bracelet Advanced Loom skillz! Firstly, I have completed my second loom band. The first basic, the second an ‘advanced’ Starburst Bracelet! Katie was relieved, I think I may have annoyed her with my failed attempts, but the final result was somewhat fantastic (I say so myself, and that’s all!). Perhaps more importantly, Jane has responded to her fans and published one of her own patterns for sale. You can view it, along with a selection of other patterns in the shop which has links to Ravelry for purchasing. Please have a ‘mooch’, and let us know if there are any other patterns Jane has created that you’d like to see available to buy. As always, please also share your creations on her Facebook page, or via Twitter!